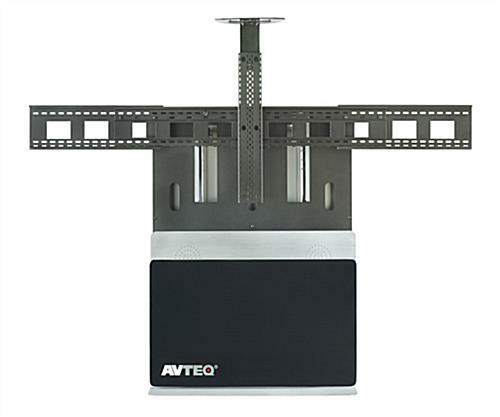 This Monitor Stand Secures the Flat Panel TV with a VESA Bracket! 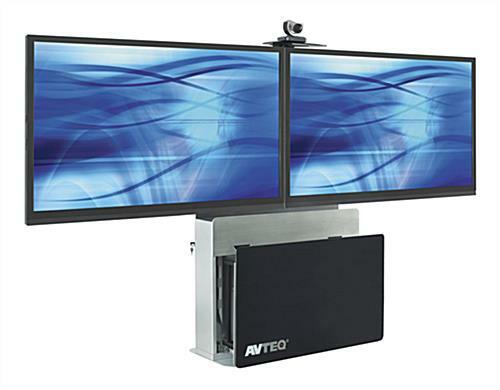 This Video Conferencing Workstation Is a Plasma Mount with a Heavy Duty Metal Exterior! This Monitor Stand Is of the Highest Quality! Included six outlet surge protector charges AV equipment. Bracket uses universal VESA mounting patterns for 200mm x 200mm to 800mm x 600mm. Presents (2) screens up to 70" that are 400 pounds in total. This monitor stand comes with a black tempered glass door that opens a sliding cabinet space. The plasma mount feature the silver finished steel fabrication for durability. This monitor stand, also called a deluxe flat screen display, holds two large screens at once for big presentations. The double mount system features a VESA mounting pattern for simple TV attachment. This monitor stand for video conferencing uses a camera shelf that can adjust in height to meet the needs of the users. The internal cabinet features a rack mount shelf system for organizing the AV equipment. This monitor stand offers 10 rack units of space for all sorts of components. Users can power these electronics with the included six port surge protector.